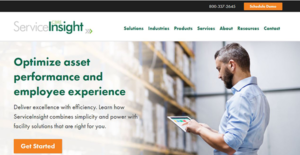 ServiceInsight is an innovative, web-based facility management software designed by CBRE for facility managers, employees, technicians, and vendors working in medium to large enterprises. It’s a reliable solution that enables real estate occupiers in multiple industries including education, banking/finance, retail, supermarket, and more to drive asset optimization and improve the employee experience. The program combines simplicity and power to help users accomplish facility operations with efficiency. ServiceInsight is a ground-breaking workplace command center that delivers highly scalable solutions to improve facility insight and reduce occupancy costs. It streamlines facility maintenance processes with insightful tools that aggregate and analyze data to help facility management teams realize full potential. Some of its helpful features include portal solutions, mobile apps, inventory management, advanced analytics, reporting, dashboards, inspections, and AP invoicing. ServiceInsight is a robust facility management solution that delivers tremendous benefits to midsized and large businesses. The platform comes with great features that make it easy to continually improve business performance and optimize customer experience. One of its renowned modules is the ServiceInsight Hub. This module serves as a unified command center for managing call center operations, assets, and overseeing facility team resource apportionment. It’s an easy-to-use tool that provides a central place to create work orders, view performance, generate preventive maintenance schedules and procedures, and more. The hub improves communication and allows you to leverage notifications via text, mobile apps, or email, to keep your teams updated. Another innovative feature of ServiceInsight is CMMS Mobile applications. It provides comprehensive yet easy-to-use Android and IOS applications that simplify the operations for technicians and employees. The applications remove the paperwork to improve documentation, boost productivity for technicians, and connect employees to their workspace to improve their engagements. Better still, they enable facility managers to gain efficiency across the facility team thanks to the mobile workforce and real-time data. Additionally, the accounts payable invoicing module is designed to streamline the accounting process. The module features an AP invoice Batch tool designed to assist your accounts payable department to organize vendor invoice for expedient approvals and accurate payments. This feature makes it easy to track and report on a batch of AP invoices or create invoice batch reports on a time interval of your liking. On the other hand, ServiceInsight has a reliable inventory management module. The module empowers facility teams to monitor existing inventory for maintenance and ascribe them to work orders for an all-inclusive reporting. The system makes it easy to track all purchases and receipts of treasured inventory while eliminating discrepancies between available and reported inventory. If you are considering ServiceInsight it might also be a good idea to investigate other subcategories of Best Facility Management Software gathered in our base of B2B software reviews. Each company has its own characteristics, and can call for a special Facility Management Software solution that will be fit for their business size, type of clients and staff and even particular industry they deal with. It's not wise to count on finding a perfect services that will work for each company no matter what their background is. It may be a good idea to read a few ServiceInsight reviews first and even then you should remember what the solution is intended to do for your company and your staff. Do you need a simple and straightforward app with just elementary functions? Will you really make use of the complex functionalities needed by experts and big enterprises? Are there any specific tools that are especially beneficial for the industry you work in? If you ask yourself these questions it is going to be much easier to get a trustworthy solution that will match your budget. How Much Does ServiceInsight Cost? ServiceInsight doesnt publish its enterprise pricing details. Contact the vendor for a custom pricing quote. We realize that when you make a decision to buy Facility Management Software it’s important not only to see how experts evaluate it in their reviews, but also to find out if the real people and companies that buy it are actually satisfied with the product. That’s why we’ve created our behavior-based Customer Satisfaction Algorithm™ that gathers customer reviews, comments and ServiceInsight reviews across a wide range of social media sites. The data is then presented in an easy to digest form showing how many people had positive and negative experience with ServiceInsight. With that information at hand you should be equipped to make an informed buying decision that you won’t regret. What are ServiceInsight pricing details? What integrations are available for ServiceInsight? If you need more information about ServiceInsight or you simply have a question let us know what you need and we’ll forward your request directly to the vendor.